This disturbing Richard Attenborough directed horror movie features Hopkins as Corky Withers (and as the voice of Fats), a shy magician with some confidence issues and little charm who fails in his small club performances. 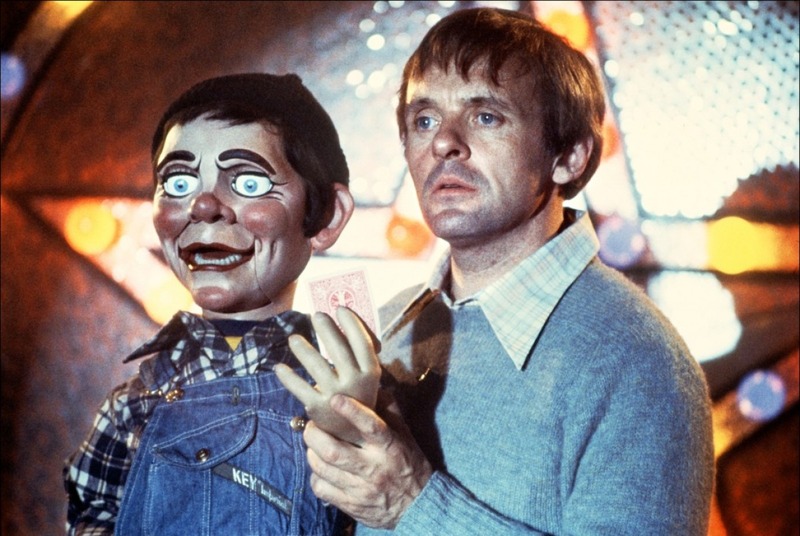 In order to become successful, Corky becomes a ventriloquist and adds a dummy named Fats to his act. Fats is creepy and foul-mouthed but excels in areas where Corky sees himself lacking. Corky becomes a disturbed man who can’t separate himself from his dummy and starts to have conversations with him. Hopkins gives a great performance as the creepy and chilling magician, representing two different characters in one schizophrenic personality. 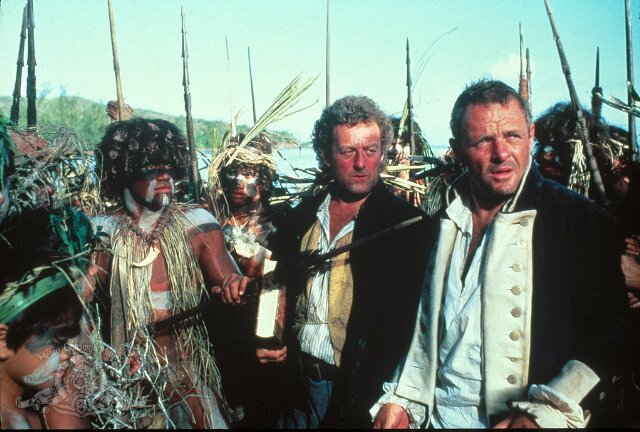 Hopkins plays Lieutenant William Bligh alongside Daniel Day-Lewis (John Fryer), Liam Neeson (Seaman Charles Churchill) and Mel Gibson (Fletcher Christian) in this solid remake of the classic naval tale. The story depicts the events surrounding the 1787 mutiny on the H.M.S. Bounty. As the leader of a ship full of troubled men and their clashing temperament, Hopkins gives top-notch performance as the complex and honorable Bligh. 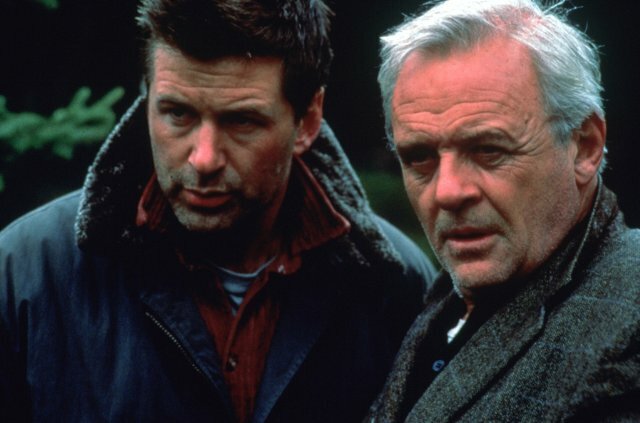 Hopkins is calm and introspective billionaire Charles Morse in this action-filled survival movie written by David Mamet and directed by Lee Tamahori. Charles is a sophisticated, intelligent and gentle man with a photographic memory. He is struggling with Bob Greene (Alec Baldwin) and the idea that the younger man and his young trophy wife (Elle Macpherson) may be lovers. Bob is a rude and physically robust man jealous of Morse’s wealth. He plans to kill Morse during the photo shoot safari in which they’re all participating in a remote section of Alaska. This is an intense movie with great dialogue and a compassionate message. 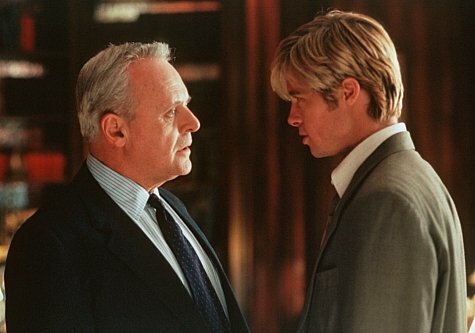 Four years after Legends of the Fall, Brad Pitt (as Death/Joe Black) and Hopkins (Bill Parrish) teamed up again in Meet Joe Black, directed by Martin Brest. In this reworking of 1934’s ‘Death Takes a Holiday’, Hopkins gives an elegiac and wistful performance as a millionaire who seems to have everything but is forced to deal with the idea of imminent death. Death is literally waiting for him in the form of Joe Black (Pitt), who wishes to experience life before taking Bill with him. Bill agrees to be his guide. This is an engaging true story with Hopkins playing New Zealander Burt Munro, who took his modified motorcycle to the Bonneville Salt Flats in Utah to set a new land speed record for that type of vehicle. The story focuses on how Burt came to America and made his way to Utah, instead of focusing on the speed record aspect. Munro discovered that his dreams weren’t serious to some people. He still managed to surround himself with others who wanted to help him. Anthony Hopkins is Professor Abraham Van Helsing in this gorgeous cinematic adaptation by Francis Ford Coppola, which was nominated for 4 Academy Awards, winning three. In the shadow of Gary Oldman’s performance as Dracula, Anthony manages a memorable performance with a brutish style as the vampire hunter. Van Helsing is an eccentric and charming character as played by Hopkins, who takes the audience on a marvelous journey, managing to reinvent the Van Helsing character as humorous and likable. Directed by Richard Attenborough, this adaptation of the play by William Nicholson has Hopkins playing C. S. Lewis, author of Chronicles of Narnia novels and teacher at Oxford during the 30’s. This romantic biopic takes a route from other films of its sub genre. Instead of focusing on Lewis, it follows the romance of the writer with a Jewish American woman who travels to England to meet him. 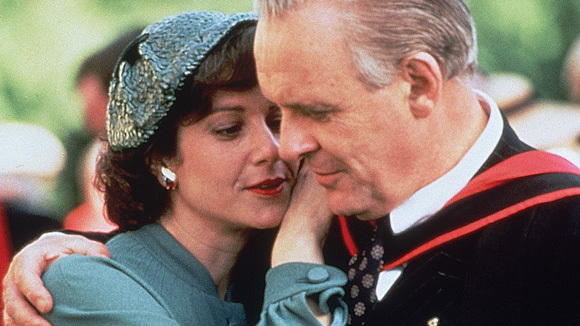 Hopkins’ C. S. Lewis is a repressed man who suppresses emotions with intellect, questioning God due to the presence of Joy Gresham (Debra Winger) in his life. This is a journey through Lewis’ life filled with moments of inner healing and love. It explores the kind of love which grows, not the kind of love based on physical desire.